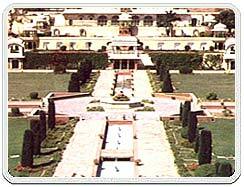 The terraced Sisodia Rani Ka Bagh (the Garden of Sisodia Queen) is situated at a distance of 10 kms. from Jaipur, which was produced by the queen of Jai Singh II, Sisodia Rani, as an escape from the court intrigues. 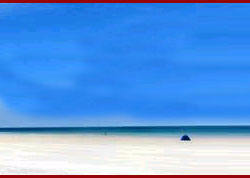 It is a beautiful escape with landscaped gardens and murals of the life of Lord Krishna, decorating its interiors. The garden is one of the many summer retreats built during the 17th and 18th centuries by Jaipur royals. Not far from here on the way to Galta are natural springs and temples of Lord Vishnu, Lord Shiva, and Lord Hanuman. It consists of a central room with galleries on three sides, around which are terraced gardens graced by fountains and pools. Their elegance further graced by magnificent pieces of sculptures. The best-preserved one is Vidyadhar-ka-Bagh, constructed by Vidyadhar - the builder of the city, with shady trees, flowing water, an open pavilion and suites of living rooms. The reason the Sisodia Rani ka Bagh garden is so captivating is because it not only displays the skill of a human hand but also the beauty of nature that very often goes unappreciated. Its murals and paintings vividly depict the legends of Radha-Krishna and it has many scenes and murals that depict the frolicking Krishna in his youth and various hunting scenes. And of course, it has green grass, and various kinds of plants including many flowering and fragrant shrubs. The garden may have been a summer retreat for the royalty and nobility in the 18th and 19th century but now we all can enjoy the refreshing air and fragrance of the garden. If you are a city-dweller then this is truly a feast for the eyes, since such greenery and clean surroundings are hard to find in the cities. 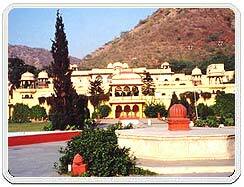 So, if you badly need a break and want to visit the Sisodia Rani ka Bagh, then come to Jaipur in Rajasthan and check out the beauty of the garden with your own eyes. You can also check out the natural springs that lie on the way to Galta and pay your respects at the temples of Lord Vishnu, Hanuman and Shiva.